Whether it’s oppressively hot or the bitter cold of winter, there’s never a bad time to dive under the sea at the New England Aquarium. Over a million visitors head to Long Wharf each year and pop in to check out the aquarium’s vast collection of marine life, which just added a new bundle of joy! 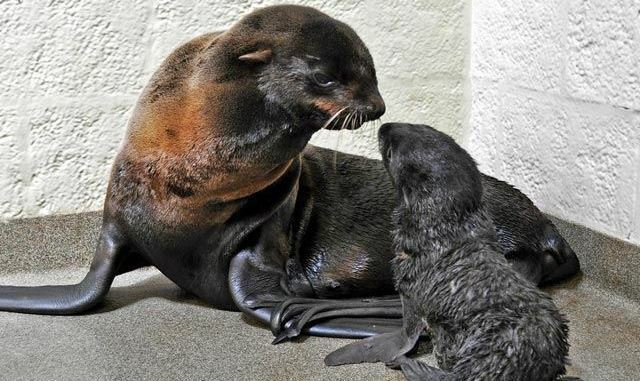 Tipper, a five-year-old California sea lion gave birth eight weeks ago to Ron, a sea lion pup who is now officially on public view! You can check him out at the Marine Mammal Center frolicking around with his sea lion clique. He is not yet ready for the regular sea lion program, but Boston magazine says he’s taking notes from the sidelines. While Ron is not yet old enough to chow down on fish like his elders, his mother Tipper is eating 25 pounds of fish a day (twice the normal rate!) to feed her son. Before or after you visit Ron, check out the four-story Giant Ocean Tank and the hundreds of fish within. No trip is complete without a peek at the penguins—try to plan your visit around one of the two daily feedings. Make an afternoon of it and check out the aquarium’s whale watching tours!